- with a high capacity-to-footprint ratio, only 22" wide. - Simple design allows easier organisation of amenities. - Long-lasting structural web plastic ad non rusting aluminum. Expansive Storage Space removable bins and caddies let staff restock before they clean, increasing productivity by eliminating search time for additional supplies. 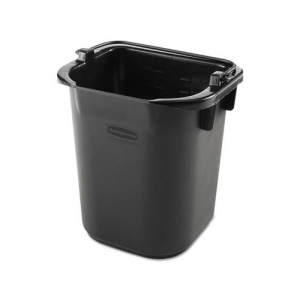 Add additional bins, caddies, and pails (FG9T8400BLA, FG9T8200BLA, 1857378, and 1857391). 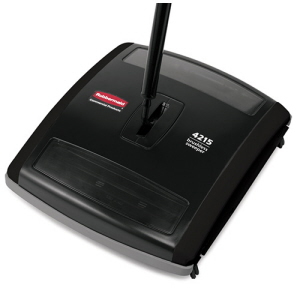 Durable 8" ball bearing wheels and 4" casters makes manuverablity easy and quiet for workers. Interchangeable handles and removable platform allow user to easily expand or reduce the footprint of the cart to meet specific cleaning and storage needs. 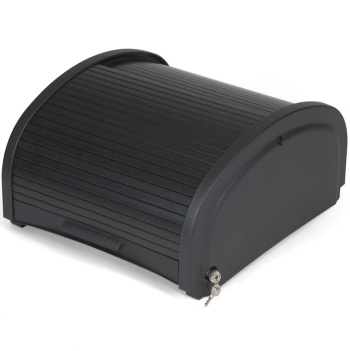 Preassembled locking security hood speeds up assembly and ensures all products will be secure. Secure Cabinet Doors keep cleaning supplies concealed from view and locked up when carts are unattended. Vacuum holder and bungee for simple, secure transport of upright vacuums (1868440 or 1868622) or a Pulse (1863885 or 1863884). 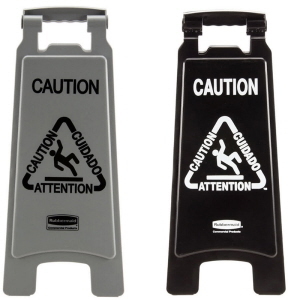 Rubber Tool Grips and Hooks securely hold up to 5 stick goods, while hooks hold up to 4 safety signs. Water and chemical-resistant finish provides easy maintenance and long-lasting good looks. Carry all your supplies with you as you go. 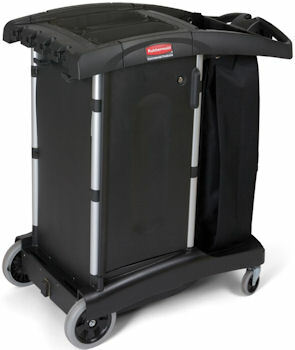 The Rubbermaid Turndown housekeeping cart is a complete system solution for your microfiber cleaning needs. Service up to 12 guest rooms with this compact high capacity cart. 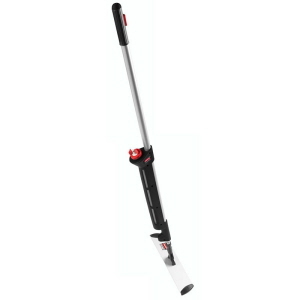 Ergonomic and lightweight housekeeping solutions. 28% more compact when folded-up. Secure and conceal supplies and amenities while still being able to access items from both sides. It conceals supplies easily by adding this accessory to update the look of any cart. 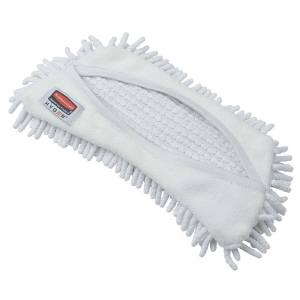 Microfibre flexi frame helps clean quicker and more effectively.